Since 1994, Peacebuild – the Canadian Peacebuilding Network – has produced dozens of reports, policy briefs, and fact sheets on issues related to peacebuilding and armed conflict. Publication categories include: Afghanistan; Children, Youth and Armed Conflict; Peace and Conflict Impact Assessment; Peacebuilding; Peace Operations; Prevention of Armed Conflict; Small Arms and Light Weapons; Women, Peace and Security; and Workshop Reports. 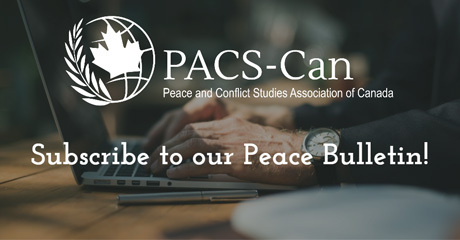 Peacebuild, formerly the Canadian Peacebuilding Coordinating Committee (CPCC), is a member-based network of Canadian non-governmental organizations and individuals actively involved in peacebuilding practice and policy development. Their goal is to engender greater coherence and effectiveness in building peace through fostering collaboration and coordination among diverse stakeholders in Canada and with partners overseas. Increase overall effectiveness of peacebuilding interventions.